If you’re looking for a casino game that will really get your pulse racing, Super Spin Doctor mobile slots is just what the doctor ordered! The particular physician we’re talking about here is of course the brains behind this operation, Dr Slot himself. Here, he’s spliced together his favourite fruity symbols with his trademark neon, then injected some additional medical symbols for good measure. If it’s massive multipliers you’re after, the Dr prescribes playing his two thrilling bonus features, Wild Reels and Pulse Rate. Super Spin Doctor is compatible with iOS 10 and above, and Android 5 and above. It also features 15 win lines and a fast-growing progressive Jackpot. Win that and your excitement is bound to be contagious! Ready to play? Before you scrub up and get stuck in, you’ll need to set your total bet per spin. Press the ‘Bet’ button in the bottom left corner to access your settings. Then, use the ‘+’ and ‘-’ buttons to increase or decrease your bet per line. Super Spin Doctor is fixed at 15 win lines, so your bet-per-line will always be multiplied by 15 to determine your total bet. This will adjust automatically in the ‘Total Bet’ box as you alter your settings. For example, if you choose to bet 10p per line, your total bet will be £1.50. You can bet anything from 1p up to £10 per line. When your settings are looking healthy, tap the white floating arrow to begin. Sick of having to keep pressing the spin button? There’s a handy Auto Spin feature that can come to your aid. In the same menu as your settings, you’ll find an ‘Auto Spin’ button. To activate it, choose a number of spins and then set a minimum credit level that you don’t want to fall below. You can also set auto spins to stop if you have a single win exceeding your chosen amount. Press the white arrow to begin, and hit ‘Stop’ at any time to return to manual play. Playing Super Spin Doctor isn’t exactly brain surgery! You just need to remember that you can play in landscape or portrait mode, simply by tilting your device, and that win lines always pay left to right. When you’ve sorted your settings, all that’s left to do is press the white floating arrow to spin those reels. The symbols will spin in at random and then it’s time for the diagnosis! Have you lined up enough matching symbols on an active win line? Some symbols will grant you a win if you line up just two or more, while most pay out with a minimum of three. There’s no need to perform a complicated examination to work out if you’ve won though! Any wins will be highlighted on screen and the winning symbols will burst into life. If you’ve won, your prize will automatically go into your credit balance before your next spin. Each winning combination of Super Spin Doctor symbols will earn you a multiplier of your original bet-per-line. Some symbols are worth more than others, and the more of them you line up, the bigger your prize will be. To check-up on full details of the multipliers associated with each symbol combination, tap the three horizontal lines in the top left corner and select ‘Paytable’. It’s important to have your finger on the pulse here, so there are a few things to remember. You can only win once on any individual win line, so only the highest value symbol combination on each line will count. However if you win on more than one line in a single spin, we’ll add up your prizes to give you a seriously healthy total win. Dr Slot’s Wild symbols are easy to spot – they’re the big, red neon letters that say ‘Wild’! You’ll definitely want to see them on your win lines, because they can stand in for most other symbols to grant you a win. For example, if you have two lemons lined up with a Wild alongside, you’ll win the multiplier for three lemons. We hope this isn’t a hard pill to swallow, but Wilds can’t substitute for mini-game or Free Spins symbols, and you can’t win the progressive Jackpot with a Wild on your winning line. You need five of the heart monitor Jackpot symbols to do that! Super Spin Doctor mobile slots has two great mini-games to boost your wins. First up, if you spin in three or more one-armed-bandit symbols anywhere on the reels, you’ll enter the Wild Reels! The amount of spins you get here corresponds with how many mini-game symbols you enter the game with, so you’ll get 3, 4, or 5 spins for lining up 3, 4, or 5 symbols. Press the white arrow to spin the reels. If you line up three matching symbols of any kind on the middle row, you’ll win the relevant multiplier displayed to the left of the reels. Just like on the main reels, Wilds can substitute for other symbols to score you a win. If you don’t line up matching symbols or a winning combination of symbols and Wilds, you’ll win nothing. When you’ve used up all of your spins, you’ll collect any multipliers you’ve won and return to the main reels. Next, line up three or more doctor’s bag symbols to play Pulse Rate, which gives you the chance to win some massive multipliers with your medical meddling! There’s a very poorly patient laid out on the operating table, and if you can cure him, you could be in for a big win. Our patient is in need of several procedures, all of varying difficulty. The trickier it is to perform, the higher the multiplier on offer. To begin, press one of the heart buttons. The difficulty meter on the right will tell you how difficult that operation is to perform. If you think it’s too risky, you can press ‘Leave’ and choose another. If you decide to go for it, press ‘Take’ to attempt the procedure! Succeed and you’ll win the multiplier and get to pick again. If you fail a procedure, you’ll collect any prizes you’ve won so far and exit the mini-game. 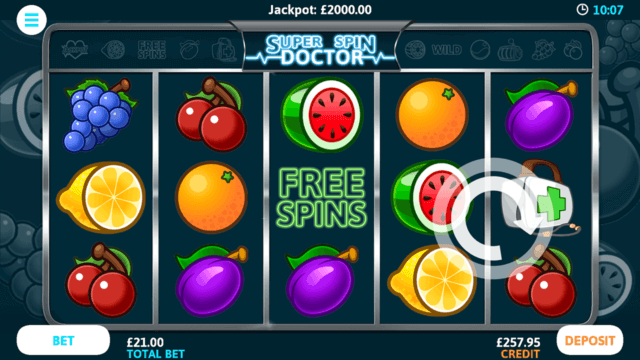 If you spot Dr Slot’s green neon Free Spins symbol, you could be about to receive a serious dose of excitement! That’s because if you spin in 3, 4, or 5 Free Spins symbols anywhere on the reels, you’ll receive 5, 7, or 9 free spins respectively. When your free spins begin, your bet-per-line will lock to the values of your last spin. You won’t be able to change them until your free spins have finished, but of course, your credit won’t be charged for these spins. You’ll see the amount of free spins you have left displayed at the top of the reels. If this is your first visit to Dr Slot’s surgery, you can get up to 120 FREE SPINS and up to £1,000 deposit match! * When you create your first account, you’ll receive up to 20 no deposit free spins on one of our most popular mobile slots games. You’ll find full details of Dr Slot’s welcome bonus offers, including T&Cs, right here. Super Spin Doctor mobile slots has a theoretical return to player of 94.6%. This is based on long term playback.